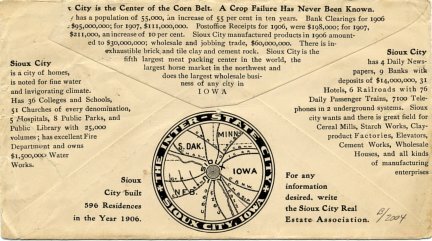 One way that communities in the first two decades of the 20th century sought to attract new businesses was through advertising on envelopes. These envelopes typically included pictures on the front of the envelope that depicted significant buildings and attractions in the community. 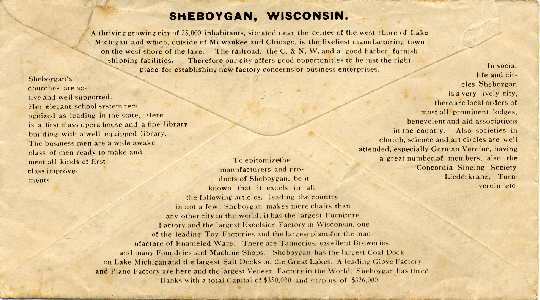 The back of these envelopes included written text which made the case for locating in a particular community. During this same period new public library buildings were being built in communities across the country, many as the result of grants from philanthropists such as Andrew Carnegie. So it is not surprising that libraries are often one of the buildings being depicted on the front of the envelope. 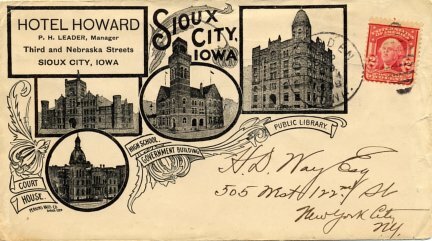 The Sioux City Public Library is prominently represented on this envelope which was mailed in 1908. The written text on the back of the envelope (see below) indicates that the library had 25,000 volumes. The public library was founded in 1877. Sioux City received Carnegie grants for two libraries totaling $85,000 in 1911. 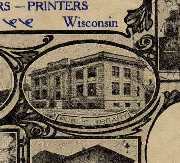 The building shown on the envelope above predates the main Carnegie building and the branch Carnegie building for Sioux City shown at the Carnegie Libraries in Iowa Project website. 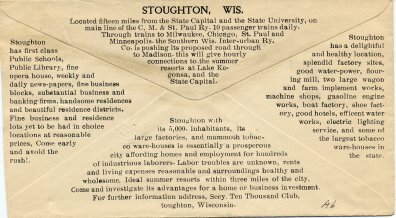 This envelope is for the community of Stoughton and it has an image of the building that housed the city hall, the library, and the opera house. 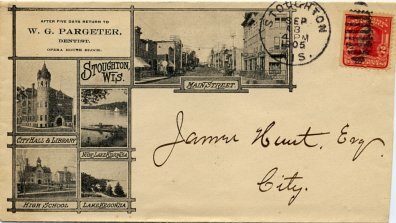 The envelope was mailed in September of 1905. In December of 1905 Stoughton received a grant from Andrew Carnegie to build a separate public library building. 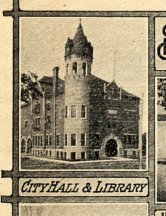 Both buildings are still in existence in Stoughton and the Carnegie building has been incorporated into an expanded public library. 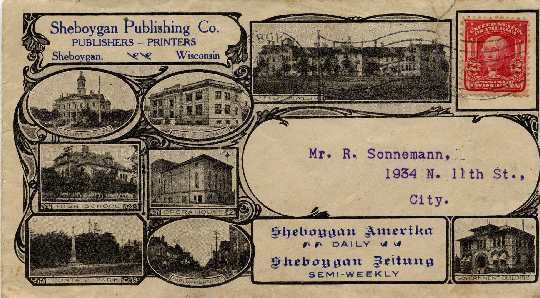 The Carnegie Library in Sheboygan, Wisconsin is pictured on this civic advertising envelope. All but a portion of the Carnegie building has been razed. The new library is the Mead Public Library. 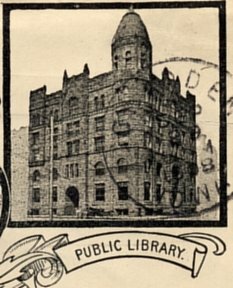 The text on the back of the envelope below says in part "Have a first class opera house and a fine library building with a well equipped library."